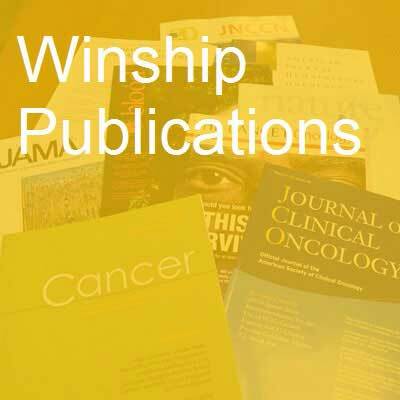 More than a dozen first authors and over 50 senior authors from Winship Cancer Institute have published studies in major medical and scientific journals in the past month. Cytopathologic diagnosis of oncocytic type intraductal papillary mucinous neoplasm: Criteria and clinical implications of accurate diagnosis. Reid MD, Stallworth CR, Lewis MM, Akkas G, Memis B, Basturk O, Adsay V. Cancer cytopathology. 2015; PubMed PMID: 26415076. Simulation for Teaching and Assessment of Nodule Perception on Chest Radiography in Nonradiology Health Care Trainees. Auffermann WF, Henry TS, Little BP, Tigges S, Tridandapani S. Journal of the American College of Radiology : JACR. 2015; PubMed PMID: 26421854. Pediatric and Adolescent Extracranial Germ Cell Tumors: The Road to Collaboration. Olson TA, Murray MJ, Rodriguez-Galindo C, Nicholson JC, Billmire DF, Krailo MD, Dang HM, Amatruda JF, Thornton CM, Arul GS, Stoneham SJ, Pashankar F, Stark D, Shaikh F, Gershenson DM, Covens A, Hurteau J, Stenning SP, Feldman DR, Grimison PS, Huddart RA, Sweeney C, Powles T, Lopes LF, Dos Santos Agular S, Chinnaswamy G, Khaleel S, Abouelnaga S, Hale JP, Frazier AL. Journal of clinical oncology : official journal of the American Society of Clinical Oncology. 2015; 33(27):3018-3028. PubMed PMID: 26304902. Comorbidities, smoking status, and life expectancy among individuals eligible for lung cancer screening. Howard DH, Richards TB, Bach PB, Kegler MC, Berg CJ. Cancer. 2015; PubMed PMID: 26372542. Randomized, Placebo-Controlled, Phase III Trial of Yeast-Derived Granulocyte-Macrophage Colony-Stimulating Factor (GM-CSF) Versus Peptide Vaccination Versus GM-CSF Plus Peptide Vaccination Versus Placebo in Patients With No Evidence of Disease After Complete Surgical Resection of Locally Advanced and/or Stage IV Melanoma: A Trial of the Eastern Cooperative Oncology Group-American College of Radiology Imaging Network Cancer Research Group (E4697). Lawson DH, Lee S, Zhao F, Tarhini AA, Margolin KA, Ernstoff MS, Atkins MB, Cohen GI, Whiteside TL, Butterfield LH, Kirkwood JM. Journal of clinical oncology : official journal of the American Society of Clinical Oncology. 2015; PubMed PMID: 26351350. Somatic mutations associated with MRI-derived volumetric features in glioblastoma. Gutman DA, Dunn Jr WD, Grossmann P, Cooper LA, Holder CA, Ligon KL, Alexander BM, Aerts HJ. Neuroradiology. 2015; PubMed PMID: 26337765. An Economic Evaluation of a Self-Care Intervention in Persons With Heart Failure and Diabetes. Reilly CM, Butler J, Culler SD, Gary RA, Higgins M, Schindler P, Butts B, Dunbar SB. Journal of cardiac failure. 2015; 21(9):730-7. PubMed PMID: 26164214; PubMed Central PMCID: PMC4554981. Tobacco Taxes in the Southeastern US States: Views from Former Legislators. Berg CJ, Solomon M, Barkley A, Bailey E, Goodwin SB, Kegler MC. Health behavior and policy review. 2015; 2(5):333-342. PubMed PMID: 26236755; PubMed Central PMCID: PMC4517976. Reactions to Cigarette Taxes and Related Messaging: Is the South Different? Berg CJ, Ribisl KM, Thrasher JF, Haardarfer R, O'Connor J, Kegler MC. American journal of health behavior. 2015; 39(5):721-31. PubMed PMID: 26248181; PubMed Central PMCID: PMC4530464. Malpractice and Public Policy: Are they Separable? Cohen MA. Radiology. 2015; 276(3):929-930. PubMed PMID: 26302395. Combination of GM-CSF With Fludarabine-Containing Regimens in Chronic Lymphocytic Leukemia and Indolent Non-Hodgkin Lymphoma. Cohen JB, Bucur S, Winton EF, Sinha R, Heffner LT, King N, Lonial S, Langston AA, Waller EK, Hutchison-Rzepka A, Colbert A, Lechowicz MJ, Flowers CR. Clinical lymphoma, myeloma & leukemia. 2015; 15(9):514-8. PubMed PMID: 26297176. An overview of Cancer's special issue on lung cancer in China. Khuri FR. Cancer. 2015; 121 Suppl 17:3049-51. PubMed PMID: 26331808. Lung cancer in China: The new frontier? Ramalingam SS, Khuri FR. Cancer. 2015; 121 Suppl 17:3058-60. PubMed PMID: 26331811. Editorial Comment. Brawley OW. Urology. 2015; 86(3):504. PubMed PMID: 26282018. A cost and time analysis of laryngology procedures in the endoscopy suite versus the operating room. Hillel AT, Ochsner MC, Johns 3rd MM, Klein AM. The Laryngoscope. 2015; PubMed PMID: 26422328. Phase I Study of the Investigational NEDD8-activating Enzyme Inhibitor Pevonedistat (TAK-924/MLN4924) in Patients with Advanced Solid Tumors. Sarantopoulos J, Shapiro GI, Cohen RB, Clark JW, Kauh JS, Weiss GJ, Cleary JM, Mahalingam D, Pickard MD, Faessel H, Berger AJ, Burke K, Mulligan G, Dezube BJ, Harvey RD. Clinical cancer research : an official journal of the American Association for Cancer Research. 2015; PubMed PMID: 26423795. 3D in vivo imaging of rat hearts by high frequency ultrasound and its application in myofiber orientation wrapping. Qin X, Wang S, Shen M, Zhang X, Lerakis S, Wagner MB, Fei B. Proceedings of SPIE--the International Society for Optical Engineering. 2015; 9419. PubMed PMID: 26412926; PubMed Central PMCID: PMC4581442. Population-specific prognostic models are needed to stratify outcomes for African-Americans with diffuse large B-cell lymphoma. Chen Q, Ayer T, Nastoupil LJ, Koff JL, Staton AD, Chhatwal J, Flowers CR. Leukemia & lymphoma. 2015; :1-26. PubMed PMID: 26415108. Plasma membrane vesicles decorated with glycolipid-anchored antigens and adjuvants via protein transfer as an antigen delivery platform for inhibition of tumor growth. Patel JM, Vartabedian VF, Bozeman EN, Caoyonan BE, Srivatsan S, Pack CD, Dey P, D'Souza MJ, Yang L, Selvaraj P. Biomaterials. 2015; 74:231-244. PubMed PMID: 26461116. Signaling Scaffold Protein IQGAP1 Interacts with Microtubule Plus-end Tracking Protein SKAP and Links Dynamic Microtubule Plus-end to Steer Cell Migration. Cao D, Su Z, Wang W, Wu H, Liu X, Akram S, Qin B, Zhou J, Zhuang X, Adams G, Jin C, Wang X, Liu L, Hill DL, Wang D, Ding X, Yao X. The Journal of biological chemistry. 2015; 290(39):23766-80. PubMed PMID: 26242911. Real-time fluorescence imaging with 20â€‰nm axial resolution. Stabley DR, Oh T, Simon SM, Mattheyses AL, Salaita K. Nature communications. 2015; 6:8307. PubMed PMID: 26392382. Role of T-cell reconstitution in HIV-1 antiretroviral therapy-induced bone loss. Ofotokun I, Titanji K, Vikulina T, Roser-Page S, Yamaguchi M, Zayzafoon M, Williams IR, Weitzmann MN. Nature communications. 2015; 6:8282. PubMed PMID: 26392000. Roles of adjuvant and salvage radiotherapy for desmoplastic melanoma. Oliver DE, Patel KR, Switchenko J, Parker D, Lawson DH, Delman KA, Kudchadkar RR, Khan MK. Melanoma research. 2015; PubMed PMID: 26397051. The BET bromodomain inhibitor, JQ1, facilitates c-FLIP degradation and enhances TRAIL-induced apoptosis independent of BRD4 and c-Myc inhibition. Yao W, Yue P, Khuri FR, Sun SY. Oncotarget. 2015; PubMed PMID: 26415225. A mitochondrial DNA mutation influences the apoptotic effect of statins on prostate cancer. Sun Q, Arnold RS, Q Sun C, A Petros J. The Prostate. 2015; PubMed PMID: 26383260. Inefficient Resource Use for Patients Who ReceiveÂ Both a Chest Radiograph and Chest CTÂ inÂ a Single Emergency Department Visit. Hanna TN, Shuaib W, Kerchberger JM, Johnson JO, Khosa F. Journal of the American College of Radiology : JACR. 2015; PubMed PMID: 26387774. The flavonoid p-hydroxycinnamic acid exhibits anticancer effects in human pancreatic cancer MIA PaCa-2 cells inÂ vitro: Comparison with gemcitabine. Yamaguchi M, Murata T, El-Rayes BF, Shoji M. Oncology reports. 2015; PubMed PMID: 26397991. Transthoracic versus transhiatal resection for esophageal adenocarcinoma of the lower esophagus: A value-based comparison. Khullar OV, Jiang R, Force SD, Pickens A, Sancheti MS, Ward K, Gillespie T, Fernandez FG. Journal of surgical oncology. 2015; PubMed PMID: 26374192. The top 100 articles in the radiology of trauma: a bibliometric analysis. Dolan RS, Hanna TN, Warraich GJ, Johnson JO, Khosa F. Emergency radiology. 2015; PubMed PMID: 26377425. Large Polyglutamine Repeats Cause Muscle Degeneration in SCA17 Mice. Huang S, Yang S, Guo J, Yan S, Gaertig MA, Li S, Li XJ. Cell reports. 2015; PubMed PMID: 26387956. A Regenerative Microchannel Device for Recording Multiple Single Unit Action Potentials in Awake, Ambulatory Animals. Srinivasan A, Tipton J, Tahilramani M, Kharbouch A, Gaupp E, Song C, Venkataraman P, Falcone J, Lacour SP, Stanley GB, English AW, Bellamkonda RV. The European journal of neuroscience. 2015; PubMed PMID: 26370722. Identification of Bile Duct Paucity in Alagille Syndrome: Utilizing CK7 and EMA Immunohistochemistry as a reliable panel for accurate diagnosis. Herman HK, Abramowsky CR, Metry D, Cundiff CA, Romero R, Gillespie SE, Shehata B. Pediatric and developmental pathology : the official journal of the Society for Pediatric Pathology and the Paediatric Pathology Society. 2015; PubMed PMID: 26366614. Substaging of Lymph Node Status in Resected Pancreatic Ductal Adenocarcinoma Has Strong Prognostic Correlations: Proposal for a Revised N Classification for TNM Staging. Basturk O, Saka B, Balci S, Postlewait LM, Knight J, Goodman M,Kooby D, Sarmiento JM, El-Rayes B, Choi H, Bagci P, Krasinskas A, Quigley B, Reid MD, Akkas G, Maithel SK, Adsay V. Annals of surgical oncology. 2015; PubMed PMID: 26362048. HIF1Î±-Induced by Lysophosphatidic Acid Is Stabilized via Interaction with MIF and CSN5. No YR, Lee SJ, Kumar A, Yun CC. PloS one. 2015; 10(9):e0137513. PubMed PMID: 26352431. Super-Resolution Microscopy Reveals Altered Desmosomal Protein Organization in Pemphigus Vulgaris Patient Tissue. Stahley SN, Warren MF, Feldman RJ, Swerlick RA, Mattheyses AL, Kowalczyk AP. The Journal of investigative dermatology. 2015; PubMed PMID: 26352055. Reference Standardization for Mass Spectrometry and High-Resolution Metabolomics Applications to Exposome Research. Go YM, Walker DI, Liang Y, Uppal K, Soltow QA, Tran V, Strobel F, Quyyumi AA, Ziegler TR, Pennell KD, Miller GW,Jones DP. Toxicological sciences : an official journal of the Society of Toxicology. 2015; PubMed PMID: 26358001. Wss1 metalloprotease partners with Cdc48/Doa1 in processing genotoxic SUMO conjugates. Balakirev MY, Mullally JE, Favier A, Assard N, Sulpice E, Lindsey DF, Rulina AV, Gidrol X, Wilkinson KD. eLife. 2015; 4. PubMed PMID: 26349035. Survival After Sublobar Resection vs. Lobectomy for Clinical Stage IA Lung Cancer: An Analysis from the National Cancer Data Base. Khullar OV, Liu Y, Gillespie T, Higgins KA, Ramalingam S, Lipscomb J, Fernandez FG. Journal of thoracic oncology : official publication of the International Association for the Study of Lung Cancer. 2015; PubMed PMID: 26352534. Stereotactic body radiation therapy versus no treatment for early stage non-small cell lung cancer in medically inoperable elderly patients: A National Cancer Data Base analysis. Nanda RH, Liu Y, Gillespie TW, Mikell JL, Ramalingam SS,Fernandez FG, Curran WJ, Lipscomb J, Higgins KA. Cancer. 2015; PubMed PMID: 26348268. Analytical cell adhesion chromatography reveals impaired persistence of metastatic cell rolling adhesion to P-selectin. Oh J, Edwards EE, McClatchey PM, Thomas SN. Journal of cell science. 2015; PubMed PMID: 26349809. Community-based participatory research principles for the African American community. Smith SA, Whitehead MS, Sheats JQ, Ansa BE, Coughlin SS, Blumenthal DS. Journal of the Georgia Public Health Association. 2015; 5(1):52-56. PubMed PMID: 26336653; PubMed Central PMCID: PMC4554535. Expression of the NMDA receptor subunit GluN3A (NR3A) in the olfactory system and its regulatory role on olfaction in the adult mouse. Lee JH, Wei L, Deveau TC, Gu X, Yu SP. Brain structure & function. 2015; PubMed PMID: 26334321. DNA methylation provides insight into intergenerational risk for preterm birth in African Americans. Parets SE, Conneely KN, Kilaru V, Menon R, Smith AK. Epigenetics. 2015; 10(9):784-792. PubMed PMID: 26090903. Magnetic Resonance Enterography (MRE) Healing and MRE Remission Predicts Improved Outcome in Pediatric Crohn Disease. Sauer CG, Middleton JP, McCracken C, Loewen J, Braithwaite K, Alazraki A, Martin DR, Kugathasan S. Journal of pediatric gastroenterology and nutrition. 2015; PubMed PMID: 26348683. Response to Saul. Xue Y, Ankala A, Wilcox WR, Hegde MR. Genetics in medicine : official journal of the American College of Medical Genetics. 2015; 17(9):761. PubMed PMID: 26331192. Plerixafor in combination with granulocyte-colony-stimulating factor after chemotherapy increases mobilization efficiency in patients with lymphoma or myeloma: results of a Phase II clinical trial. Jagirdar N, Harvey RD, Nooka A, Flowers C,Kaufman J, Lonial S, Lechowicz MJ, Langston A, Lipscomb C, Gaylor C, Waller EK. Transfusion. 2015; PubMed PMID: 26331348. Transforming growth factors and receptor as potential modifiable pre-neoplastic biomarkers of risk for colorectal neoplasms. Tu H, Ahearn TU, Daniel CR, Gonzalez-Feliciano AG, Seabrook ME, Bostick RM. Molecular carcinogenesis. 2015; 54(9):821-830. PubMed PMID: 24719252. Inorganic phosphate induces cancer cell mediated angiogenesis dependent on forkhead box protein C2 (FOXC2) regulated osteopontin expression. Lin Y, McKinnon KE, Ha SW, Beck Jr GR. Molecular carcinogenesis. 2015; 54(9):926-934. PubMed PMID: 24700685; PubMed Central PMCID: PMC4183733. Endoscopic Management of Early Esophageal Cancer. Barnes JA, Willingham FF. Journal of clinical gastroenterology. 2015; 49(8):638-646. PubMed PMID: 26125458. Reactions to Cigarette Taxes and Related Messaging: Is the South Different? Berg CJ, Ribisl KM, Thrasher JF, HaardÃ¶rfer R, O'Connor J, Kegler MC. American journal of health behavior. 2015; 39(5):721-31. PubMed PMID: 26248181; PubMed Central PMCID: PMC4530464. Relation of Vitamin E and Selenium Exposure to Prostate Cancer Risk by Smoking Status: A Review and Meta-Analysis. Kim Y, Wei J, Citronberg J, Hartman T, Fedirko V, Goodman M. Anticancer research. 2015; 35(9):4983-96. PubMed PMID: 26254398. Endoscopic Transsphenoidal Pituitary Surgery: Recurrent Pituitary Adenoma: 3-Dimensional Operative Video. Chu J, Oyesiku N. Neurosurgery. 2015; 11 Suppl 3:467. PubMed PMID: 26284352. Co-culturing with High-Charge and Energy Particle Irradiated Cells Increases Mutagenic Joining of Enzymatically Induced DNA Double-Strand Breaks in Nonirradiated Cells. Li Z, Doho G, Zheng X, Jella KK, Li S, Wang Y, Dynan WS. Radiation research. 2015; 184(3):249-258. PubMed PMID: 26284422. Tobacco and China: The worst is yet to come. Paskett ED, Bernardo BM, Khuri FR. Cancer. 2015; 121 Suppl 17:3052-4. PubMed PMID: 26331809. Stimuli-Responsive Nanoparticles for Targeting the Tumor Microenvironment. Du J, Lane LA, Nie S. Journal of controlled release : official journal of the Controlled Release Society. 2015; PubMed PMID: 26341694. Simulating cardiac ultrasound image based on MR diffusion tensor imaging. Qin X, Wang S, Shen M, Lu G, Zhang X, Wagner MB, Fei B. Medical physics. 2015; 42(9):5144. PubMed PMID: 26328966; PubMed Central PMCID: PMC4537486. Early detection of lung cancer in China: The immediate imperative. Veeraraghavan S, Ramalingam SS, Khuri FR. Cancer. 2015; 121 Suppl 17:3055-7. PubMed PMID: 26331810. Case 2: Cardiovascular Shock Following Acute Gastroenteritis in a 17-year-old Boy. Merjaneh L, Meacham LR. Pediatrics in review / American Academy of Pediatrics. 2015; 36(9):417-9. PubMed PMID: 26330476. Computer Simulation, Bioinformatics, and Statistical Analysis of Cancer Data and Processes. Archer KJ, Dobbin K, Biswas S, Day RS, Wheeler DC, Wu H. Cancer informatics. 2015; 14(Suppl 2):247-51. PubMed PMID: 26380548. Intranasal Delivery of Apelin-13 Is Neuroprotective and Promotes Angiogenesis After Ischemic Stroke in Mice. Chen D, Lee J, Gu X, Wei L, Yu SP. ASN neuro. 2015; 7(5). PubMed PMID: 26391329.